KAMLOOPS, British Columbia (12 October 2009) - United Floors honoured four of its members for their outstanding contributions to the group during its recent conference here. Among those recognized were Lyle and Marie Horneland, who were named dealers of the year for 2008. United Floors, like its sister group, United Carpet, is a network of independent floor covering retailers operated by the Montreal-based Cantrex. United Floors operates approximately 14 storefronts in Alberta, Ontario, Quebec and New Brunswick while United Carpet operates another 14 storefronts in British Columbia and Saskatchewan. The Hornelands, owners of United Floors in Peace River, Alberta, received the Peter Schell Dealer of the Year Award in recognition of their outstanding contributions to the group. "They best exemplify the United program and portray the high standards of store appearance inside and out and worked with the United product and marketing programs to the maximum," Cantrex said in a statement. Paul Dekker (second from right), owner of Conway Furniture/United Floors in Listowel, Ontario is this year's recipient of the Loyalty Award from United Floors. Looking on are Terry Bemister (left), Bonnie McLean (second from left) and Pierre Caron (right), all of Cantrex. Parnell Pinette of United Carpet in Williams Lake, British Columbia, received the Don Thomson Marketing Person of the Year Award in recognition of his participation and support of the group's marketing program. In addition to implementing the program in his store, he also contributed his time and ideas to the program's development. 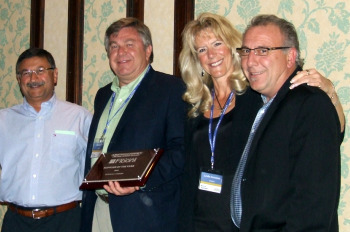 Jim Campbell of United Carpet in Victoria, British Columbia was the 2008 recipient of the Customer Satisfaction Award. This award is given to the member who receiving the highest satisfaction rated from his customers. Paul Dekker of United Floors in Listowel, Ontario received the Loyalty Award. This is given to the member with the highest rate of purchases from the program's preferred suppliers. The Supplier of the Year Award was presented to Beaulieu Canada. Voted on by the members, Beaulieu was chosen Supplier of the Year in recognition of their exceptional products, services and support of the United program. Beaulieu Canada was named Supplier of the Year by the members of Cantrex's United Floors/United Carpet banner. 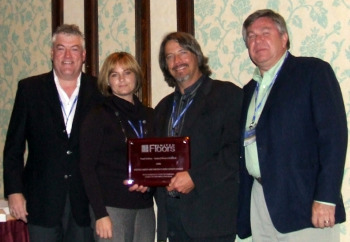 Receiving the award on behalf of the Montreal-based flooring manufacturer and distributor is Dave Wizowski (at left) and Ron Higgins (far right). Presenting the award are Pierre Caron and Leslie Beaumont (centre) of Cantrex.